While most materials expand when heated, a few show the opposite behaviour, known as negative thermal expansion (NTE). The record holder, which has the greatest rate of volume contraction upon warming over a wide temperature range, is single-network cadmium cyanide (we previously blogged about the double-network version). This unusual phenomenon is useful – if you combine an NTE material with a normal material in just the right ratio, you can make a mixture with zero thermal expansion. Such a composite is immune to the undesirable effects of thermal expansion, from the buckling of railway tracks in the heat, to quartz-crystal clocks gaining or losing time when it’s too hot or cold. A related group of frameworks which also show NTE are the lanthanoid hexacyanidocobaltates, with chemical formula LnCo(CN)6, where Ln can be any element from the lanthanoid row of the periodic table from lanthanum (La) to lutetium (Lu), Co is cobalt, and CN is cyanide. The cyanide is tightly bound to the cobalt, so these materials aren’t particularly toxic, unlike potassium cyanide. They can be easily crystallised from a solution as shown in this time-lapse video, recorded over the course of a few hours. LaCo(CN)6·5H2O is easy to grow, and forms nice hexagonal crystals. By the end of the video, they are about 2 mm in size and have started to merge together. 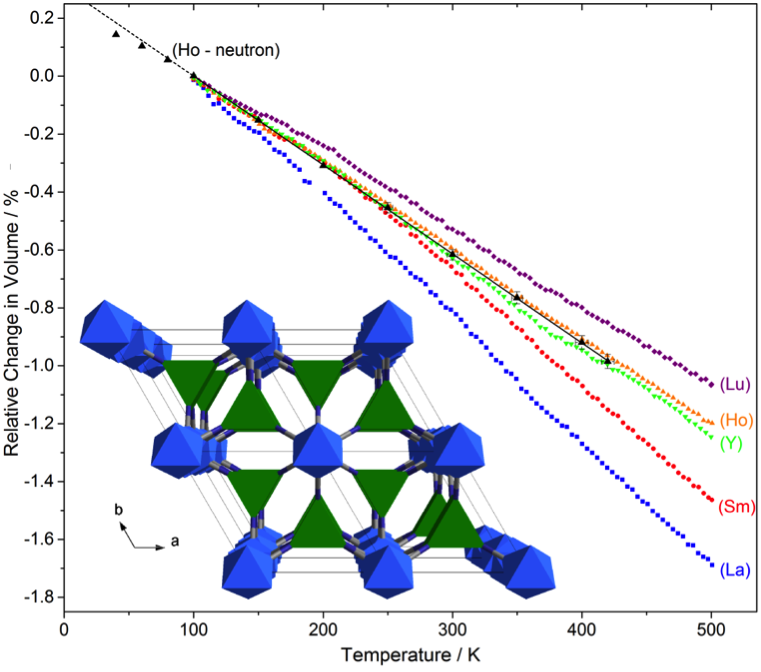 Once the water is removed from the crystal structure by heating, the NTE properties are activated. The key to the NTE is the networked structure of the materials. 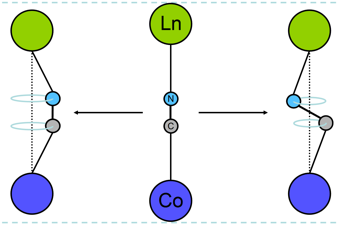 The lanthanoid and cobalt atoms are ‘bridged’ together by the cyanide (CN) ions. As the temperature rises, these linkers start to vibrate more and more in skipping-rope-like transverse (sideways) vibrations. Just like the ends of a skipping rope get closer together when you vibrate it, these transverse motions cause the average metal-metal distances to decrease, thereby causing contraction of the crystal. The LnCo(CN)6 frameworks’ lanthanoid and cobalt metal atoms are linked together by cyanide bridges. ‘Skipping rope’ transverse thermal vibrations of these bridges bring the metal atoms closer together and cause the contraction of the whole material as it heats up. Crystallography (powder diffraction in this case) allows the dimensions of the unit cell to be precisely measured, which lets us monitor the thermal expansion of materials by taking diffraction measurements at a number of different temperatures. The results for a series of LnCo(CN)6 compounds are shown in the plot below, and demonstrate that we can tune the NTE properties just by making the material with different lanthanoid metals. Swapping Lu for La doubles the steepness of the plot. This is because La bonds more loosely to the cyanide linkers than Lu does, making a more flexible framework with bigger transverse vibrations, and therefore bigger NTE. The crystal structure of LaCo(CN)6 is made up of trigonal prismatic lanthanum (green) and octahedral cobalt (blue) metal atoms linked together by cyanide bridges (grey/blue). The plot shows the negative thermal expansion (NTE) behaviour of several different LnCo(CN)6 frameworks (with Ln = La, Sm, Y, Ho and Lu) measured using X-ray powder diffraction at the Advanced Photon Source. Larger lanthanoid metals, such as La, give a more flexible framework and a stronger NTE effect. The neutron diffraction measurements (black) allow us to go to lower temperatures, revealing how the NTE behaviour dies out, deviating from the nice straight line as the transverse vibrational modes “freeze out”. These results were published in S.G. Duyker et al. (2013), Angew. Chem. Int. Ed., 52: 5266–5270. Prof Batten tells a tale of why it’s always healthy to be skeptical! One of the most important qualities of a scientist is scepticism. The predisposition to doubt conclusions without solid supporting evidence is vital. Nowhere does this apply more than to your own work. So when one of my colleagues requested my help with a structure that they thought contained 54 interpenetrating three-dimensional networks my initial reaction was that, in polite terms, they’d made a mistake somewhere and I’d need to find it. Yes, interpenetration of networks is quite common in framework structures – see, for example, the two interpenetrating diamond nets in the structures of zinc cyanide and cadmium cyanide, discussed previously on this blog. But the previous ‘record’ was only 18 nets, an exceptional number in itself. This was three times that – there was no way that so many independent 3D networks could pass through each other without bumping into themselves, nevermind the incredible self-assembly process that must happen for such a structure to form. It simply defied belief. The structure did, of course, contain 54 interpenetrating, independent networks. Each network was composed of silver atoms bridged by tri(4-imidazolylphenyl)amine ligands. 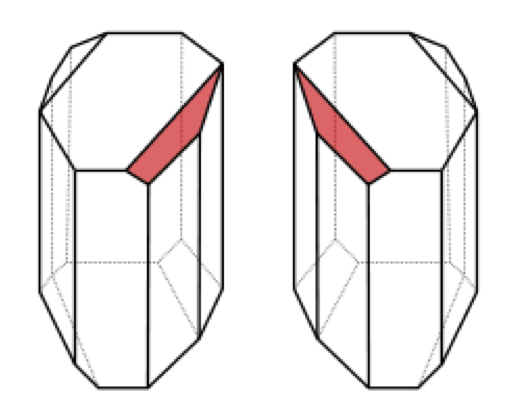 The ligands bridged in two different ways – one was bound to three metals, while the other coordinated to only two. Furthermore, all the silver atoms connected to only two ligands, meaning that the branching points of the networks, the centres of the 3-connecting ligands, were interconnected by parts of two 3-connecting ligands, pairs of silver atoms, and a 2-connecting ligand. As the ligands themselves were quite large, the nodes were therefore an enormous 36.85 Å apart. This very large distance between the nodes meant that an individual net was extremely spacious, and gave the necessary room for 53 other networks to form and entangle with the first. So a few hours and one headache later I found myself confirming that yes, the structure did indeed have that many unconnected networks all tangled up together. Another interesting feature of this structure was that the networks formed had the “(10,3)-a” topology. This network is of particular interest because it is chiral – i.e. there are two different versions of the net that are mirror images of each other (in the same way that your left and right hands are mirror images and different). 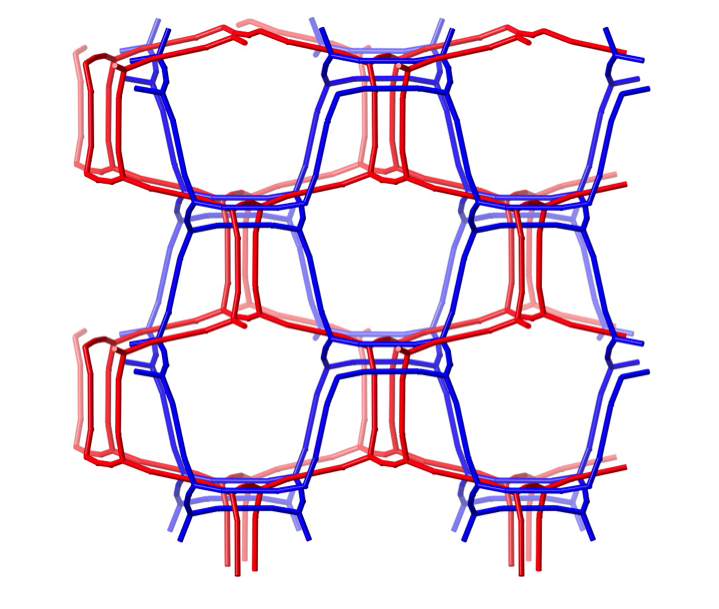 Remarkably, nets of both “handedness” were present in this structure – 27 of each – to give an arrangement that was overall nonchiral (or racemic – see the tartaric acid blog post for an explanation of this applied to discrete molecules rather than infinite networks). Two of the 54 interpenetrating networks are shown schematically in the figure. Although distorted from the most symmetrical version of the (10,3)-a topology, the chirality of the nets can be seen in the rectangular spirals. Those of the blue net spiral into the page in an anti-clockwise fashion, while those of the red net spiral into the page in a clockwise fashion. The real structure, of course, squeezes another 52 nets into the space you see here. Where did the structure come from? Pasteurized Crystals – Tartaric acid. December 27 marks the 192nd birthday of Louis Pasteur, which means that (a) he’d be really old if he hadn’t died in 1895, and (b) today is the perfect day to talk about tartaric acid. Tartaric acid occurs naturally in many plants, particularly grapes. You’ve already read about ‘wine diamonds’ (potassium bitartrate), but you may not be aware of the contribution tartaric acid has made to scientific language. Naturally occurring tartaric acid, first isolated in 1769, was found to rotate plane polarized light to the right. When it was prepared synthetically, tartaric acid had identical properties, except that it didn’t rotate plane polarized light. The synthetic material was thought to be a different compound, and was named racemic acid (from racemus, Latin for ‘a bunch of grapes’). It was subsequently determined that tartaric acid can exist in two different forms; and that naturally occurring tartaric acid was L-tartaric acid, while ‘racemic acid’ was actually an equal mixture of D and L-tartaric acid, mirror image isomers (enantiomers). These enantiomers were optically active in opposing directions, appearing optically inactive; this explained the otherwise identical properties of tartaric acid and racemic acid. For this reason, ‘racemic’ came to mean ‘an equal mixture of enantiomers’, and this term continues to be ubiquitous in organic chemistry today. So where does Pasteur fit into this story? Early in his career, before he discovered vaccination, microbial fermentation and invented the process which still bears his name (pasteurization), Pasteur studied crystals of tartaric acid and ‘paratartaric acid’ obtained from wine sediments. In particular, he wondered why (as described above) tartaric acid rotated light, while paratartaric acid did not, even though the chemistry and elemental composition of the two were identical. In one of the most beautiful and famous experiments in the history of science, Pasteur noticed, while squinting down a microscope, that there were two subtlety different types of crystals in the samples of paratartaric acid, each the mirror image of the other (see diagram below). He very carefully (and tediously) separated the two types of crystals into separate piles, redissolved each pile, and found that each did indeed rotate light, but in opposite directions. He had, in effect, separated the two enantiomers from the paratartaric acid (a.k.a. racemic acid) and discovered molecular chirality. The two types of crystals found in paratartaric acid, which are mirror images of each other. 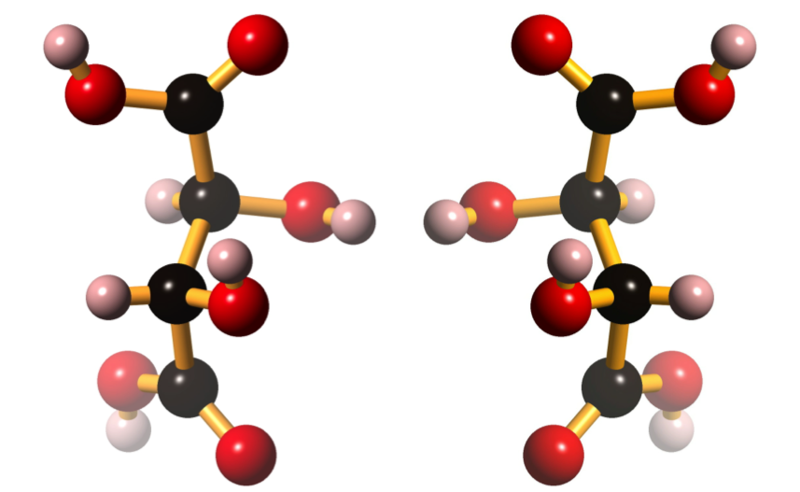 The structure of D-tartaric acid (left) and its mirror image, L-tartaric acid (right). D-tartaric acid can be found under CCDC refcode TARTAC, while L-tartaric acid is at CCDC refcode TARTAL. Is there a more evocative Christmas smell than the fragrance of a fresh pine tree? Mulled wine with cinnamon spices or a roasting turkey are close contenders for the prize, but for literary purposes let’s opt for the heady scent of a Christmas Fir. That rich winter wonderland terpentine-like citrus aroma is the product of several molecules (read more here http://www.compoundchem.com/2014/12/19/christmastrees/), the most significant of which is pinene. Researchers determined the crystal structure of (+)–α-pinene bound to CYP450 2B6 to better understand how this pine tree molecule can bind, inhibit, and alter the enzyme1. This is important to learn about how the enzymes generally interact with a diverse range of substrates. (+)-α-pinene binds tightly at the CYP450 2B6 active site. The CYP450 2B6 active site is remarkably flexible and moves and shifts to mould around the pinene molecule as it binds. This structure is of human CYP450 2B6 and is PDB ID 4I91. 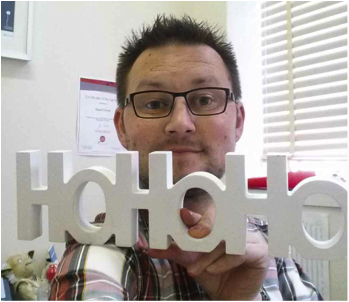 Dave T tells us of his crystallographic Christmas inspiration! Sitting at my desk on the last working Friday of the year, just minutes away from a barbeque, Dr Maynard-Casely lays down the challenge for a “cheesy-corny Christmas-themed post”. Distracted by Steve Smith’s century (on captaincy debut), thinking was not easy, until my mind turned to a project in which I am currently involved. The complex shown above is a trinuclear complex containing three holmium ions – HoHoHo. This was reported in 2005 by Junk and Deacon and contains quinolinolate anions as the ligating groups. This anion is typically used in gravimetric analysis as it coordinates to metal ions to form highly insoluble complexes. A derivative of this ligand has been used in anti-diarrhoea medication and is also being investigated in anti-Alzheimer’s medication. The structure has three holmium atoms in close proximity, bridged by the oxygen atoms of the quinolinolate ligands. A recent analogue of this compound containing dysprosium in place of holmium has been shown to act as a single molecule magnet at low temperatures (Chilton et al., Inorg. Chem., 2014, 53, 2528). This means that each molecule acts like a minute magnet, albeit at temperatures below that of liquid nitrogen. Solid state packing of these complexes is, unsurprisingly, dominated by pi-pi interactions. The structure was published in Z. Anorg. Alleg. Chem., 2005, 631, 2647. Seasons greetings. The crystal structure of Cocoa Butter. Who’d have thought that a bundle of hydrogen, carbon and oxygen could be so tasty! Here is the structure of cocoa butter fat, one of the main tasty ingredients in chocolate. Chocolate is a very sophisticated material, and requires the right blend of sugar, milk and cocoa butter fats for it to taste right. An added complication is that you can get different crystal structures of cocoa butter depending on how you solidify it. These have different melting temperatures, so can affect the whole experience of the chocolate tasting. The type you want to have is called ‘Type V’ or ‘Beta 2’, and is why chocolate has to be tempered – to make sure you get the right type. 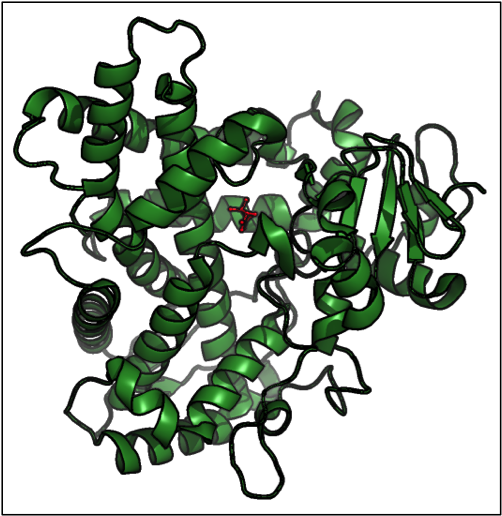 The image was generated using the structure determined by van Mechelen et al. in 2006. They used synchrotron x-rays to determine this structure and were trying to understand how fat bloom (which is, in fact, a different structure of cocoa butter ‘type VI’) forms in chocolate. Hello, Helen here – coordinator of the blog. As we look to the ‘sprint finish’ to the end of the year I thought I would write about a structure that I’m personally connected too – in fact it got me a PhD! The structure of methane B, the red spheres are the carbon atoms found at the centre of the molecules. This was found with high-pressure x-ray synchrotron diffraction and unfortunately did not reveal the positions of the hydrogen atoms. Normally you only think of methane as a gas, but if you cool it to -145 °C it will liquefy, and then pretty soon after solidify to a solid that is quite like jelly (known a plastic solid – argon gas does the same thing). But another way to freeze methane, like water too, is to compress it to very high-pressure. 5 GPa in fact (which is equivalent to five fully-grown African elephants standing on one stiletto heel. At this point methane freezes to a structure know as methane A, which we wrote about earlier this year. But if you keep squeezing methane, up to 8 GPa, then it undergoes a change to a new structure that, until yesterday, was a bit of a mystery. This form of methane is known as methane B, and is a rather complex cubic structure with 58 molecules needed in each repeating unit to describe it. It’s pretty important as the pressure range that it is stable over spans to pressures that you would find inside the giant planets Uranus and Neptune. These wonders of our solar system are both thought to have an interior of mainly methane, water and ammonia, so knowing the structure of methane at these pressures really helps our understanding of them. 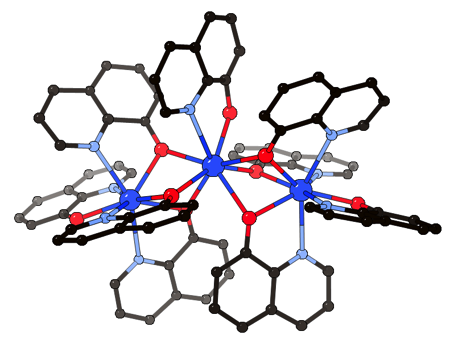 The rather strange thing about this structure is that we’ve seen it before – in manganese. Alpha-manganese also take up the same complex structure with 58 atoms all arranged the same. Not a pairing that you immediately put together, methane and manganese, but this is perhaps giving us a very vital clue as to how methane interacts at high-pressures. This structure was published YESTERDAY in the Journal of Chemical Physics and was found, well, by me! The structure probably looks a little strange as I was only able to find the carbon atom positions (i.e. the centres of the methane molecules). It’s so shiny new that I’ve not got round to putting it into a database yet, but you can read the paper for free for the next 30 days! 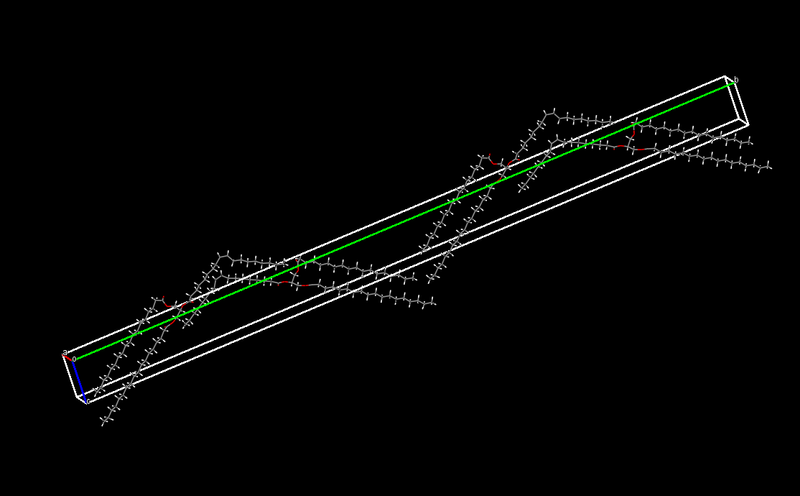 Though I promise I will put it into the Crystallography Open Database, first thing in the new year.